You'll be £15.99 closer to your next £10.00 credit when you purchase Wargaming Nineteenth Century Europe 1815-1878. What's this? Order within the next 9 hours, 8 minutes to get your order processed the next working day! Neil Thomas presents a set of fast-playing rules for wargaming the conflicts that reshaped Europe in the period 1815-78. This often-neglected period includes such significant conflicts as the Crimean War, the Italian Risorgimento, the wars of Bismarck's Prussia against Denmark, Austro-Hungary and France and ends with the Russo-Turkish war. Tactically, it saw armies struggle to adapt Napoleonic doctrines to incorporate important technological advances such as breech-loading rifles, greatly improved artillery and the first machine guns. A brief analysis of the essential strategic and tactical military developments of the period sets the context for the elegantly simple rules which are easy to learn, quick to play and yet deliver realistic outcomes. A selection of generic scenarios, covering flank attacks, pitched battles and meeting engagements, is supported by army lists for twenty-eight different armies. There are also twelve historical scenarios, ranging from the Battle of the Alma in the Crimean War to Sedan in 1870, the decisive battle of the Franco- Prussian War, each with historical background, deployment map, orders of battle and any special rules for that engagement. Useful appendices include a guide to further reading, an overview and price guide to the many scales and ranges of figures available, and a selection of useful addresses for the gamer. This is the ideal book for those new to gaming this period and veterans alike. A clever set of rules which give a gamer, especially a novice game for this period, a really great introduction and enough to effectively 'plug and play'. I would recommend these for anyone looking for a new period, or those who want to breath life into a period that they may have played before. This is the fourth in a series of wargaming books written by Neil Thomas, the earlier titles being Wargaming: An Introduction, Ancient & Medieval Wargaming and Napoleonic Wargaming. This time the author's attention is focussed on a period which witnessed a number of revolts throughout Europe, as well as major conflicts including the Crimean War 1854-1856, the Franco-Austrian War 1859, two Schleswig Wars 1848-1850 and 1864, the Seven Weeks War 1866, the Franco-Prussian War 1870-1871 and the Russo-Turkish War 1877-1878 amongst other actions. The book opens with a series of chapters covering such aspects of 19th century warfare, as the industrial challenge, nationalism, the revolution in firepower etc. Mr. Thomas then discusses 19th century wargaming, or rather wargaming the 19th century. He certainly has his opinions on what is current and what has gone before in period wargaming terms and some may find his views somewhat high handed, but stay with it, for everyone is entitled to their own opinions. The author then explains the reasoning behind various aspects of his own set of wargame rules before setting them out for the reader to study. I have to say that this reviewer was very impressed with the suggested rules and while I have yet to put them into action - so to speak - I have every anticipation of them working well. Five differing and fictitious wargame scenarios are offered next, before the provision of wargame army lists laid out by period. Army lists are welcomed by some wargamers and totally disregarded by others, but for all that they can provide a useful guide when raising armies. 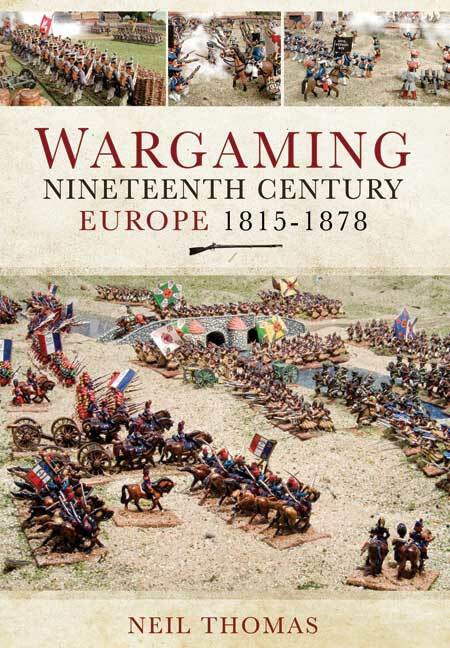 A chapter on wargaming historical battles follows, looking at re-fighting 10 actions, from Alegria 1834 to Sedan 1870. Each section provides some an historical account, a tactical map, wargame forces, special rules (where applicable) and victory conditions. An extensive bibliography, notes on figure sizes, scales and prices follows, then some useful addresses and an index. The text is supported by 33 colour photos of wargame actions. A worthy successor to the author's previous wargaming titles and highly recommended by this reviewer. I'm the first to admit that I wasn't a huge fan of Mr Thomas's first book on wargaming. His subsequent, more focussed, volumes were, in my oponion, better, but still "not quite there" (not that this seems to have made a huge difference, as all three sit on my bookshelves). The Nineteenth century is far from one of my favourite periods, and, given my opening statement, I felt that I would be unlikely to purchase this particular offering, and I flipped through it with little more than idle curiosity. I have to say that I am glad that I chose to look, as I think that Mr Thomas has finally found THE period for his style of game. He has made it a more attractive option by dint of some clever additions to his rules. He has chosen to base games around a small number of specific scenarios (pitched battle, meeting engagement, rearguard action, flank attack), rather than a straight "line 'em up and go". Whilst the organisation of his units remains recognisable to those who have read his previous efforts, the fixed army size of his other books has been abandoned in favour of a more random, scenario-driven determination of both number and composition of opposing forces, with further modifiers such as unit and command quality. All the usual features of Mr Thomas's books are present: the sketching in of the history of the period, the extensive army lists, and careful explanation of his thinking behind the rule mechanisms, as well as a selection of historical battles interpreted as scenarios. I believe that this time the whole package comes together in a way the his other books did not. My main gripe is once again related to the choice of photographs. Whilst he has once again been careful to show a range of armies in a variety of scales (from 6mm to 42mm figures) finished with varying degrees of skill, none look like the units described in the text, nor illustrate any of the scenarios described. I can genuinely say that I have been most pleasantly surprised by this book; it looks like I might be wargaming this period after all! Neil Thomas has made a name for himself in the wargaming world for simple but entertaining and practical rule systems. In his previous books he has tackled ancient, medieval and Napoleonic warfare all using the same basic mechanisms. In this volume he give the conflicts of 19th century Europe the same treatment. As well as providing an elegant set of rules he discusses the historical background in some detail and in a new departure he provides historical scenarios. Some of these are what you might expect ie Crimean or Franco-Prussian, but there are several comparitively unknown ones. Many wargamers dismiss Mr Thomas' approach as over simplistic and deride his rules as 'unrealistic'. He has dealt with these criticisms in his previous volumes and I find his arguments convincing. The aspect of his work that appeals to me most is its resemblance to the 'old school' wargaming books I read as a boy. This is not something produced by a team, with a carefully researched target audience. He is not trying to sell a range of figures or a set of rules, or even the book itself. He merely describes his own likes and dislikes and the rational behind them. Those who do not appreciate this approach will not like this book. Those who liked the earlier books or who like simple 'old school' rules will. I am happy to count myself as one of the latter. This book is a very useful primer for anyone who is thinking about wargaming this historical period. If you liked the author's previous volumes, his latest will be of interest even if the years covered are relatively unsupported by wargamers. the main appeal for me would be the idea of essentially Napoleonic armies facing the need to adapt to the reality of technological advances which produced breech loading rifles, machine guns and much more effective artillery. The author talks the common language of wargames with familiarity and the courage of his own convictions and he essentially gives a fresh treatment to old themes and ideas which, at times, made me go cold for the simple reason that, in my own book on tactics currently with my publisher, I look at similar things as the warm up act to the main tactics entertainment and even make some similar observations. I have not read the author's previous books but if you have I would be suprised to hear that this one fails to live up to the established standard as it provided me with a pleasant afternoon flicking through the comprehensive rules for the period though it rarely touched anything beyond 1815. A book that fits our period perfectly! Do not be put off by the number of pages, the 'rules' section is only eight pages long, but covers the mechanics of playing a game using figures from 2 to 42mm size. They are simply presented and easy to use, indeed I have already used the format in preparing the rules used at our game at Salute. Neil is no novice at wargame rules, having written books on 'Ancient and Medieval Wargaming' and 'Napoleonic Wargaming'. He writes in a clear and readable style giving background information where needed and giving the reader options to develop his (or her) own way of playing the game.